← How to convert format emf to tga in a command line? We would like a small size gif, what should we do when converting pdf to gif? For your question, we think you could try PDF To Image Converter v2.1. 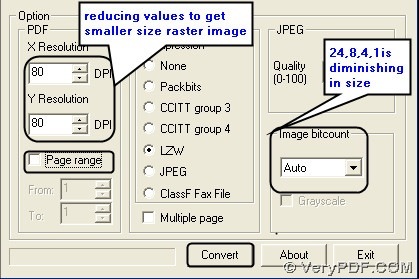 PDF To Image Converter can give you a better option for your small size issue. 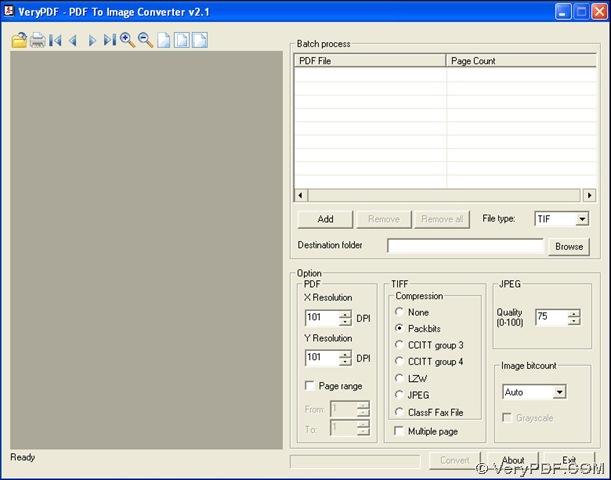 Here is the interface of PDF To Image Converter v2.1. Here is the link for downloading: http://www.verypdf.com/pdf2tif/pdf2image.exe. 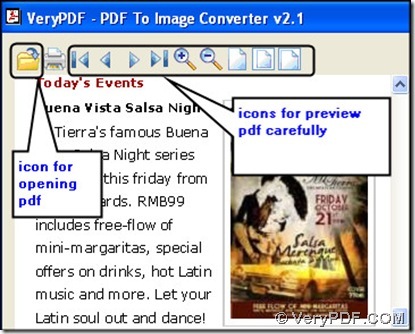 You also can buy PDF To Image Converter v2.1 here: http://www.verypdf.com/pdf2tif/index.htm#dl. Based on this request, we will give you a solution like before. 2. Add it into a table named “PDF File”, then click it and you can change another pdf to be converted if using “Remove” button. Get your file type as GIf and input a route for your destination folder. 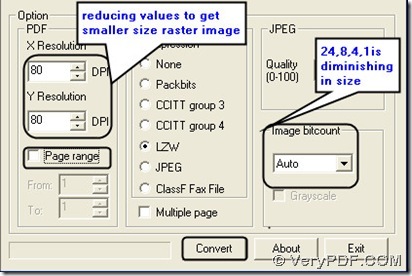 Here we change DPI to 80(101 is original) in PDF To Image Converter v2.1. 4. To convert partly pages in your pdf to gif by giving a range in “From” and “To” or converting all pages to gif images with letting the checkbox unchecked in “Page range” is also your own choice. 5. Get your progress via clicking “Convert” button on converting pdf to gif. Then shut down your PDF To Image Converter v2.1. How could we get a grayscale gif through converting pdf to gif? How to convert pdf file to emf image? This entry was posted in PDF to Image Converter and tagged PDF to GIf, PDF To Image Converter. Bookmark the permalink.